One of the interesting elements to the technology industry is the number of genuinely exuberant and enthusiastic individuals that take their segment by the horns and steer it in a confident yet knowing direction, especially when there are specific goals in mind. Aicha Evans is one such person, who I had the fortune to meet with Anand at Mobile World Congress 2014. Aicha and Anand had an interesting working dynamic, leading to continued discussion about the mobile space and particularly on Intel’s focus along with the movement of industry standards. They both starred in a series of videos for Intel back in August 2013, in which Aicha discussed many of Intel’s strengths and weaknesses, especially in RF/comms, and made a number of predictions about the future which nicely synchronize up with several of the announcements Intel made at MWC 2015 earlier this month. Post-Anand, it was important to talk to Aicha about Intel’s direction once more, along with getting updates on those prophecies. Aicha kindly agreed to an interview, which ended up being one of our most interesting free-flowing discussions at Mobile World Congress. Andrei and I would like to thank Ms. Evans for her time during a packed schedule at the event. Ian Cutress: When you spoke with Anand last time, it was ‘Everything that Computes, Connects’. Is that still the philosophy in 2015? Aicha Evans: It’s even more than a philosophy, it’s the religion! We’re making progress – I try to explain to everybody that for us it’s not really about comms as a business, it’s about comms as the capability going into all platforms. Obviously in order to be good at comms you have to have mobile platforms – hopefully you’re seeing the progress we’re making, whether it is the LTE modems or whether it is connectivity. I just spent 30 minutes with my team looking at all the demos – did you notice that the demo this time for wireless is not in the backroom but out in the front of the booth which is progress. Let’s go up the stack. Servers, they connect, maybe not wirelessly but wired and that’s fine. Then you come down to PCs. Whether it is enterprise PCs, consumer PCs, or small business PCs, it connects otherwise it is a brick – it’s about getting to the internet. Then you come down to 2 in 1s, tablets and so on – they definitely connect either by Wi-Fi, Bluetooth, and some have LTE and/or NFC. On the phone I’m sure I don’t have to convince you there! Then we come down to the whole IoT space. If it is industrial IoT then it definitely connects, such as in the manufacturing space, smart cities, grids, security cameras and so on. Then you come into consumer IoT, which seems relatively straightforward. Next up is the verticals, such as education or retail with point of sales type of things. Then you come down to the famous space that everyone is talking about – wearables. So everything connects and out of all of these segments, the only space that doesn’t require wireless (yet) I contend is servers. So for Intel to be going into all of these segments with the compute but without the connect means there is no business. I have news for you – I was just at ISMC, Intel’s sales conference. We take all the sales people to Las Vegas and I had a mini appearance in a keynote and I actually said that I am so excited, even though it took nine years but in the vision/mission or whatever you want to call it, it actually finally says ‘compute’ and ‘connected’ because it is essential. 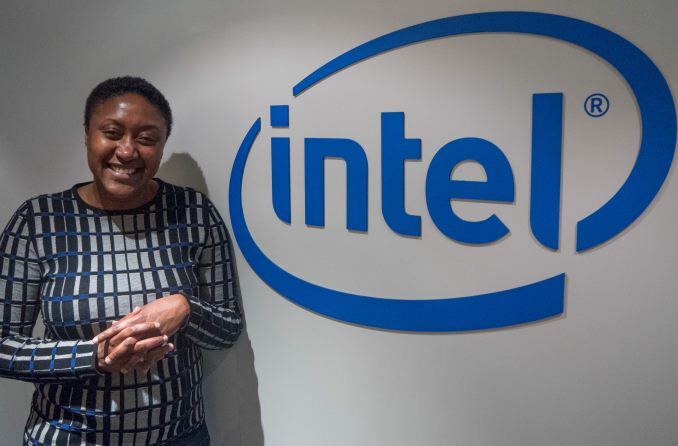 For Intel, if we’re going to be in the product business, it has got to be connected and so in addition to discrete and all these technologies, you also have to integrate. It’s not just having the IP, the product, being relevant in the ecosystem, driving the research and the standards – I mean if you go to our booth you will see partnerships with Anritsu, with Ericsson, with Nokia working with the ecosystem to advance things and then having that IP ready for integration, because especially in IoT/wearables it is going to be integrated. So definitely, compute and connectivity is more important than ever. IC: In terms of integration, one of the big announcements at MWC is that Intel now has an integrated LTE on die. AE: First of all, as AnandTech has painfully reminded me every year for the past three years, we started way behind. 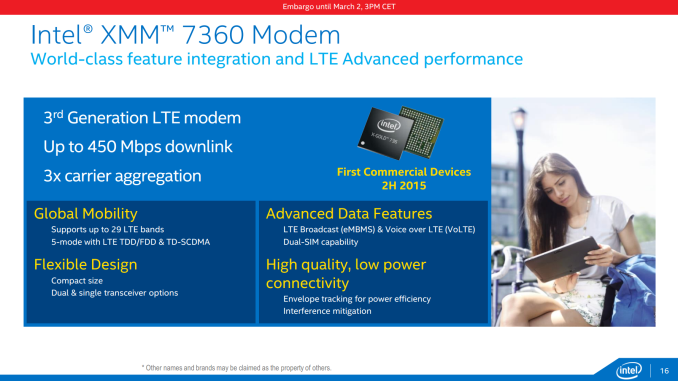 I mean I was very proud of the Intel XMM 7160 (the first generation Intel LTE modem) because we proved the capability and we started getting in the game but the reality is that we shipped that thing years after the leading competitor. You can’t really remain in the business on that schedule, so then the Intel XMM 7260 got us really close, pretty much on par. Intel XMM 7360 is now within months which is great. Next you start going into mainstream, into value, into entry and wearable/IoT where combined SoCs are necessary. We discussed last time I spoke to Anand the fact that we were working on a discrete modem cadence and roadmap but we were also working on the integration. I said we were first working on the foundry process because that is what I had in my hands and then we were working furiously to bring that into Intel technology and then we were counting on our colleagues. One thing about TMG (Intel’s Technology and Manufacturing Group), our process ‘jewels’, is that those folks know how to optimize a process so then we will start cranking on that. I’m really happy it is happening, but it was hard because we were late. IC: The integration of the modem starts in the high end Atom x3/SoFIA – are we going to see integration of LTE in the Rockchip or dual core Atom x3 models? AE: So you have x7 and x5 which are the Cherry Trail line, which we can come back to, and x3 which is the SoFIA line. The last time I saw Anand I think he was quite frustrated because he was asking about more and more SoFIA details! But look at it from my standpoint – 15 months ago it was a concept in a PowerPoint presentation and we took some pretty amazing commitment and risk. Since then, the 3G version is shipping and that is important because a lot of people said ‘why did you even bother with the 3G?’ One reason is that it is important to learn. In that engine you are not working directly with one or two big OEMs or Tier 1s – you have to have an infrastructure, you have to have a scaling engine, you have to have a master reference design and a catalogue to swap components and test them. You have to have tools to do all that and learn to prepare the manufacturing line. Atom x3 will accomplish that. With the Rockchip Atom model, showing that this partnership with Rockchip – I think it’s about a year since we signed it – and here you go, product coming to market during 1H 2015 with the LTE version coming in the second half. But as you can see at the show, we’re already out there testing with carriers and certification. So it’s been busy! IC: I remember you saying last year that “these are our goals, these are our timeframes” and it seems you are bang on to most if not all. AE: Now you’re going to jinx it! I’m proud of the team. One of the reasons I’ve been very busy during the show is that I want to spend time with them and give them a shout-out because it has been hard and stressful, but we are executing. Also, when we have issues, we don’t panic anymore. We say okay, take a deep breath, keep calm and carry on. We don’t crack under pressure – we’re pros and we know how to do this. The corporation is letting us do what we know how to do and it feels good. All I need now is VOLUME! So my goals for next year you are going to ask me? (IC: Yes please!) We have to ship Intel XMM 7360, and we have got to get volume on all of this. It doesn’t have to be huge on day one, but we have got to start taking share and building on that volume. These are huge markets, we have got to be able to do well. IC: Are you specifically talking about emerging markets here or more established markets? AE: All of them! Every single one! I want to be in emerging markets, I want volume there. I want volume in the US – we are starting now to certify devices at a normal pace. So I want volume in Europe too, I want volume everywhere. Even in the Middle East and Africa, why not? In the sub-Saharan, I’ve got 3G phones – why can’t I sell them there? IC: Does that mean more working with the local manufacturers and partners and trying to get volume that way or trying to find a big contract? AE: You know me – I think we need to do both. In this business, just having one or two big customers doesn’t work anymore. Obviously we will take care of all the Tier 1 vendors who want to work with us, no question. But one of the reasons why we established the China-tech ecosystem is exactly to penetrate that IDH, system integrators, ODMs, local OEMs and sell through them. It’s very important to us, so it is both. With all due respect, Tier 1 OEMs do not spend a lot of time trying to get 3G volume in Africa. That’s going to happen through the local OEMs, some of the operator channels like some of the big operators and so on and so forth. Whereas someone like ASUS we support as a Tier 1 OEM and that is okay. This is really the year of growing up knowing how to scale, knowing how to get volume, knowing how to ship in the open market. It is going to be nasty and it is going to be hard because this is not just about an engineering product or execution – this is about working with the sales force, working with the geos, working with companies that I didn’t even know existed! But I’m working on the business side too now so I’m actually empowered and able. I’m one of the few people at Intel with both R&D and the business side under my control, so I now have to go sell our own stuff! IC: With Rockchip, the deal was partly to enable distribution into China. Both Intel and your competitors are pinpointing Africa and South America as growth markets – what do you do to increase your ability to distribute in those markets? AE: Brazil for example, I know more about Brazil now than I ever knew from a technology standpoint – I know about their local ecosystem, and the fact that they are trying to now have local technology too. We forget, Intel has an incredible sales force, and it is not just functionality or product based but also geo-based and so for the first time in my career, even though I’ve been coming to MWC for years, but I’m now going to go to the Hong Kong Fair this year for the first time. Why? Because I am going to meet a lot of individuals to discuss with the IDH and SIs about who is shipping where and to whom. I will probably go to Brazil this year, and to México. I mean even my meetings at MWC this year were different than they used to be, and we are going to learn each ecosystem. Even yesterday I was confused when triple-SIM was discussed. Why would anyone want triple-SIM, or quad-SIM? It was explained to me that while I live in the US, in these markets each operator might have a promotion every week or a rush for two days. People like the SIM already pre-installed so they don’t have to be swapping them in and out and some of the end customers maximize the promotions. But we are learning the local solutions, learning the local ecosystems, understanding who is feeding into that, what are the rules of the game, who are the operators, go talk to them and then go at it. IC: Are there any RF challenges when it comes to these markets? Last time we talked it was all about Intel building the portfolio and making sure you have the IP end-to-end. It sounds like you have everything you have on the low end? AE: On the RF - there are challenges, but we have already solved them in the sense that you have to build an RF engine that will work, for example, on US networks or EU networks. Multi-band, RF switching and roaming – you’re actually building something high-end. But you go to certain countries and frankly they only care about four bands, so what we’ve done is started SKU-ing our RF engine. We go from the high-end multi-mode one they use letters to differentiate the SKUs but we have two or three categories of engine that are specifically geared to certain geos. IC: In terms of Intel’s SoC branding, and it was clear from the announcements that this is a big step in time for the Atom product stack. Do you fear any confusion based on one of your competitors recent rebranding of their modems? AE: I have to say that we started that structure with the Core product line for the CPU side. I don’t see any confusion on that side as customers from that space already understand how we differentiate our product lines. IC: With the current x3 solutions, the top quad-core with integrated LTE still leaves a high end market untouched. AE: I know where you’re going with this! With the current Atom x3 line, we are talking about anchors here. So one anchor is obviously the SoFIA/Atom x3 family and I think that is clear. Our CEO was also clear on this on the investor day that we will climb up that stack too. I think that on x5 and x7, we had to walk the talk. What do I mean by that? We can’t simply say that we want to become a platform company – we understand that it is system level in mobile, we understand that it is not just about the CPU. It is about the CPU, it’s the graphics, it’s the comms, it’s the imaging – everything that computes connects! At the same time we were also going to the next process node, so we had to make choices. The choice was that on Bay Trail, it wasn’t the super high-end and we had some intense discussion regarding the graphics and other things, so let us go focus there. The latest bleeding-edge process node is kind to graphics because you can pack more so we focus there. But everything is about scheduling and time to market so we seed there and we will improve on that. But we were not in a situation where we were going to go after all segments and miss that time-to-market and that’s the direction we decided to go. Also the graphics is important due to the focus on experiences and the corporation is really bullish about RealSense, and about cameras and about what is possible with cameras. You know it took me a while to get into that mindset, because people don’t have these anymore (pointing to Andrei’s digital camera). People either have an expensive SLR or they have their device – if you go to a concert these days no-one is showing up with just a digital camera. Except in the extreme sports, which has its own niche with directed products there. But if we want to be a leader in that space, and we want to be part of the 3D and more immersive/more interactive space and that includes selfies and selfie sticks. My first reaction to those was along the lines of ‘seriously? !’, but it is about the user and not me personally. This is again where everything that computes connects – we’re seeing it on the wireless side. For the downlink and uplink, we are having to optimize and pay attention to the ratio of downlink versus uplink. 10 years ago, we thought about downlink only because it was all about voice. But now with the technology, for example with my kids that had two big soccer matches back home and they didn’t wait for me to come home tomorrow before sending me their video clips of their goals. I wonder how much that will cost me, because it wasn’t over Wi-Fi(!). So we said we were going to focus on the elements where we need to improve drastically and it is logical where it feeds the experiences where we want to lead and drive the industry. But we really look at the totality of the platform and we look at not missing cadence. Period. IC: In those circumstances, is the fact that you might still be behind with each cadence an issue? AE: We are not ahead, but I am OK with that. Being vigilant is key – it was this company and Andy Grove that coined the phrase ‘Only the Paranoid Survive’. Being realistic and being respectful of the ecosystem and your competitors and partners is part of the process. I have always been super respectful of Qualcomm because they’ve earned what they have achieved. I am in awe of what MediaTek keeps on doing, it’s amazing. I think it’s a huge market and we are making steady progress. In mobile, time-to-market is at a premium. Missing a quarter in other segments might be ok, I don’t work in those fields but in mobile if you do not show up with the goods during the time-to-market window, it’s a waste. Some of the media know this because you’ve written some articles that we all read where you said ‘it’s a good device but should have been here a year ago’. We don’t want to be in that movie anymore. IC: So at point does Intel start being aggressive as the market leader? AE: Focusing last year on getting 46 million tablets was pretty aggressive. I don’t know many companies on earth that can do that. There are strategies involved, and strategy involves execution. Some people rolled their eyes when we said we would do that, but we did and it was extremely important to us. Secondly, the Atom x3 line and the comms investment are pretty aggressive. If you look at where we were four years ago, we basically had Wi-Fi and WiMAX in total. Even I, who works in this space, am walking around the wireless zone and I’m seeing NFC, GNSS and presentations about Wi-Fi+LTE and I’m glad we now have all of that as well as LTE+WiGig too! If you look at the Atom x3 line where, if you remember me talking about the pressure at the time about something that doesn’t even exit and 15 months later it’s starting to ship and there is 5 or 6 more of it. Taking the entire portfolio and moving it to 14nm is also pretty aggressive. The question then becomes ‘at what point do you start being part of the folks that are setting the pace?’. I think it is coming. We’re not sleeping – every one of those engineers that is working on 5G right now, I could go apply them to another SoC, but no, we are going to behave like leaders and people who have the broad assets to set the pace. We are setting space for innovation and for what is coming, considering the anchor points and what we are good at, so I think it is just a few years away now. But having volume is key – without volume you are nobody. It doesn’t matter how good your technology is, and that is why this is the focus. Then when you have volume you have to be responsible about how you serve that volume. I told you about the Intel XMM 7160, when the press was beating on us about volume, but if I had an order for 100 million units, I will fill it. The problem back then was a question of sustaining that level as we didn’t have the infrastructure and we didn’t know how to deal with, for example, Telefónica, or Telstra for LTE. I know how to do that in 3G, so there is a certain amount of learning, delivering, getting volume, and learning how to be a player that sustains that volume and then building on that to be profitable too. IC: In terms of barriers to volume, is it a case of building the right product or is there something missing from the portfolio? AE: It’s all to do with incumbents. I was talking to someone the other day and I started the meeting with something along the lines of ‘I understand you, you have two great incumbents – why would you want to deal with me?’. But I also ask people and operators to look at chipset diversity and a vibrant ecosystem as well as trusting what we will be able to do. Once the wireless portfolio is inside Intel manufacturing we will be able to do things that others cannot easily do, and I trust the team behind it. The most difficult part is that there are very very good entrenched incumbents – our solutions are good, but they not also delivery anything extraordinary or disruptive, so therefore how do you get a chance in that ecosystem? I’ll give the example in terms of 3G – why would someone take SoFIA 3G? For the ecosystem there is cost but also companies can start to think about their future LTE partners – do you want to wait until LTE to learn how to deal with us, because you know engineers need to talk to each other, build tools, debug, optimize and all that stuff. I think Intel can be trusted to be in this space long term and frankly it is now something that is now core to what we do. IC: What comes next for the Atom x3 line? AE: We have to hit it on 14 nanometers. Besides volume, I have to sit here next year and answer questions on how I’m executing and I’ll tell you not to jinx me again! If we execute that and when we execute that, it unleashes so many new possibilities. Second, we have to be courageous and take some of this innovation we are driving and have the courage to bring it into a SoFIA class device. IC: So this time next year we will be asking about 14nm SoFIA? AE: I sure do hope so, otherwise we have a problem. I might not even be here! But our CEO was quite clear that he wants me to ship at least one of the SoFIA line in 14nm in 2016. He literally pointed me out during the presentation to tell me! But this is important, it is another foundation we have to establish. IC: The current Atom x3 SoFIA line are currently listed with ARM Mali graphics, with the x5 and x7 line featuring Intel’s own Generation 8 graphics. 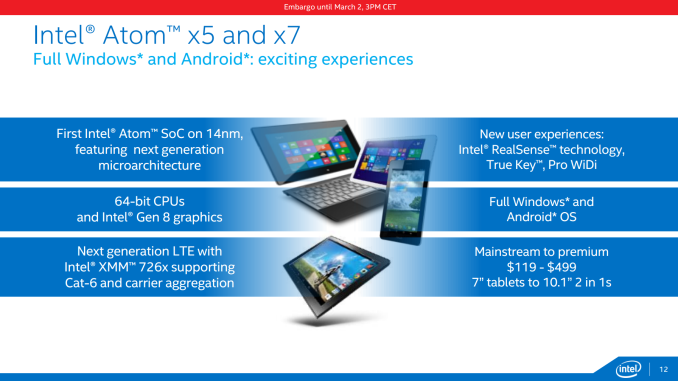 For Atom x3 on 14nm, does that mean Mali drops off? AE: Not necessarily. In mobile you have to learn not to be religious. If you map the ecosystem and look at the two flagship companies – they work with each other, and they compete. So in mobile you have to really learn to be ambidextrous, so I will use the IP that is suited for the appropriate segment. I will also optimize R&D for Intel – you have to, because margins are crazy in this space and it is a tough business. If there is you shouldn’t be doing because it is already available and there is no strategic threat then why not? I mean ARM is in the IP business and they are very good suppliers. So for this space, I will use what makes sense. So obviously in the portfolio I will carry Intel graphics, but do I want to carry three architectures? I’m not quite sure – there would have to be a business need or a business reason or maybe one of our partners would, but I can tell you I love Imagination and I am not confused about what they are able to deliver in other platforms. Hussein and his team do amazing work. Now whether we personally will use it or not I don’t know but I am very pragmatic – we look at the ASP (average selling price) band, we look at the segments, we look at the software requirements, the system level view and then we do what makes sense. IC: When it comes down to product differentiation, to decide what goes into the market at what clock speeds to provide experiences, what level of market research goes into that end-user experience? AE: An incredible amount. We just had a recent hire from the industry that saw how much we did and was like ‘wow’. We do a lot of market research, both internal and external. We sometimes have more pages of analysis that I have time to read and I have to get a synopsis! But we do it in a nice way alongside the general random sampling but we also do it from an anthropology standpoint testing what users like to do and why. We do a lot of research in this space and one of the tension points right now when you are looking at everything is innovation. You cannot innovate on everything, it just doesn’t work that way, so when you look at the experiences where we do innovate and making those choices, such as the Intel Atom x5/x7 processors and making those cases is key. We do a ton of market research – someone like Genevieve Bell, an Intel Fellow and anthropologist who specializes in technology interactions, is a good example. It can be as simple as, for example, there’s a feature we have in-house that I really like that I want to launch with someone (but I can’t tell you what it is), and I was questioning myself, in case I was being emotional about the whole thing because you know sometimes you fall in love with your own stuff. So I called Genevieve up, told her what I was thinking and asked her what she thought. First she gave me her immediate instinctive response, which was positive to start testing. We also send people into homes all around the world, so we take it very seriously. IC: I’d like to pick Genevieve’s brain at a future time – I follow her on twitter. AE: She has really interesting tweets! Unlike mine! IC: Apologies to Andrei, I haven’t given him a chance to jump in here. Andrei Frumuşanu: I think you pretty much covered everything. One thing I noticed while walking around MWC revolved around the super low power IoT things, the Category 0 and the Category 1 LTE for example. Is that something Intel is interested in? AE: It’s coming. It’s more than coming. AE: It’s coming. This is very important – last time I spoke to Anand one of the points I touched upon was that it is very easy to build one device and a hit but wireless is about pipelining. Wireless is about understanding what is going on from a regulatory standpoint, from an ecosystem standpoint, from an infrastructure standpoint, from an operator standpoint as well as a standards standpoint, especially when there are so many different standards. Synthesizing all that information is tricky and takes time – a lot of it also is gut (instinct). For example, one of the engineers on the booth, I won’t say which section, said to me ‘thanks for letting us do this!’ and I was like ‘why, what was the problem?’ and he responded ‘well it was a total bet, but we showed up with it and it was a good thing because the market leader also has the same demo so thank you for letting us do it!’. So once you synthesize the idea you have to figure out what you are prototyping, what you are getting a bet on, when are you accepting in products and so on and so forth. So Cat-0 and Cat-1 is key to that. For example, one of the press I met this week had a very old feature phone alongside his smartphone. He explained that he travels a lot and this was the only phone he knew that could consistently hold its battery for seven days and this is the phone I use to talk with my family back home. So when it comes to the whole power budget at the system level, all the way from the end-user to machine-to-machine, if you have something that needs to be charged every six hours, it isn’t going to work. So we are working on it and you can bet yourself that I don’t intend to be late. IC: A lot of your competitors have built reference platforms for makers, especially in the IoT and Wearables space (Intel has Edison). Some of them offer integrated connectivity, whereas others offer it as external modules. How is Intel planning to approach the connectivity side of it? AE: I used to think that IoT and Wearables was more the segment for Doug (Douglas Davis) and Rose’s (Rose Schooler) segment, up until today actually, at lunchtime. I used to think that this is Doug and Rose’s problem, and I adore those two and we like each other but if they need me they know where to find me. I know it all needs to be connected, because everything that computes connects, but I had a series of very intellectually stimulating discussions today and my take away response was ‘shoot, I’m being dumb. I’m not thinking!’. It means that when we get back into the office, I need to sit down with Rose and Doug and the automotive guys and we need to start thinking about reference designs and almost crowd sourcing development platforms. I’m asking myself about how I did not think about this before – BK (the CEO) always talks about makers, so it’s funny that you are asking about this during my epiphany. The more you put in these platforms the better, especially for the developers that require SDKs and so forth. So literally today I had this, so when I go back and do my reflections to the team and one of them will be that we have to start treating handsets, smartphones, tablets, 2-in-1s and everything else like meat and potatoes – it just has to be done. We have got to start shifting and our focus and our strategic thinking and execution to this wearable/IoT space. On a similar note, we had a meeting on some wearable stuff and I was surprised because I didn’t even think about what was being talked about – I won’t tell you just yet because it might be an edge for the company – and I was like ‘shoot Aicha!’ internally because it means I need to spend some thinking time to this. IC: Would that extend to home automation as well for Intel? AE: Of course. It all goes together. For one example, my kids are driving me nuts with a new toy from Christmas – they take it everywhere and it talks and they interact with it and it is like there’s another person in the house now but it needs to be connected. But for example we have an iKeg demo on the booth that allows you to pour beer (or more accurately monitor supply and real-time reporting). Something for the developer party! It was interesting that they chose that particular demo but it turned out to be really popular. IC: One of the problems with home automation is the abundance of standards. Has this been something you’ve looked into? AE: It’s a huge issue. For example, on home automation, I’ve always said to you guys that we are diligently going to march down filling the IP portfolio. If you’re going in to the home automation business and you don’t have Zigbee, life is going to be complicated. So we have some IP and some patents and things but we don’t actually have Zigbee products so that is something I’ve started thinking about. It is something we need to pay attention to. But coming from the traditional wireless space though, I have also learned that hoping to merge existing standards just doesn’t work. So some of the intelligence is in how do you make all this work together, and I think the direction that 5G is heading in right now is good because it is about making it all work together in a smarter way, in an abstracted way, in a more efficient way. One of the demos we have on the booth, for example, is using LTE over licensed spectrum that is not being used all the time. You have a lot of spectrum out there that is only is use on certain times, so we are working with European standards to lease it out for when it is not in use. So yes, there are lots of standards and the Nirvana dream of only using one is crazy because it never happens that way and I hope 5G is a forcing function that helps us abstract this and make it all work together. IC: We’ve spoken to a number of people at the show, and most of them (if they had the choice) would prefer to use Bluetooth Low Energy (LE). AE: Yes, Bluetooth LE is key. We’re working on that. To me, Bluetooth LE is table steak. I mean you can’t be talking about Bluetooth without Bluetooth LE. That’s also for all the IoT/Wearables and plays an important role there. Now is that going to solve all of the Bluetooth standards and connections? No, let’s be realistic about that. IC: Another point to note is that companies are differing on whether to focus on device-to-device connectivity or going through the cloud. AE: I think you need both. I’ve always been clear on this, and I’ve always been a champion of peer-to-peer. Bluetooth is this by definition, but even over Wi-Fi or LTE. When we talk about billions of people being connected, and the more connected you are the more you can see what is possible. This is almost like the opium of the masses. But you still need an RF engine for all that, and the faster it happens the better it is because that means that overall the world-wide middle class is rising and that’s a good thing. But if that happens to fast, we don’t have the spectrum. I don’t know what the economics are around CapEx (capital expenditure), but that is probably a very nasty situation so let’s drive efficiency. If you and I are sitting in a room and you want to send something to me, why go to the cloud? Why not go WiFi-to-WiFi? If it is small, how about Bluetooth? But, in contrast, say there is some compute do be done. For example a 3D image or a selfie panorama that requires post-processing – it makes sense to send it to the cloud. Save the battery life of the device, diffuse the compute to the cloud and it gets done. So it is about being pragmatic around the use cases, looking at spectral efficiency, looking at compute efficiency and looking at what is the smartest thing to do. I think peer-to-peer is necessary, that’s why I’ve pushed WiGig, we pushed Wi-Fi Direct previously and we’re pushing LTE direct too. There’s some FUD out there that we’re not into P2P but we are very practical. People think we are against LTE-U but we have a demonstration in our booth. What I have said is that I’m against the thinking that LTE-U will replace Wi-Fi. If you look at the install base, that makes no sense. I think last year in one of the panels I said this why as an industry we’re going to need to learn to compete but also to collaborate as responsible citizens because none of these technologies can do anything by themselves. If we want billions of more people connected to the internet then this is just physics and last I checked we haven’t found some miracle new modulation scheme. Everyone’s talking about Shannon’s Law (the Shannon-Hartley theorem about peak bandwidth in the presence of noise) starting to meet its maker, so then it’s about smart connectivity, it’s about effectiveness, it’s about efficiency and it’s understanding about the different use cases and pre-integrating the solutions to take advantage of that. IC: Two of the main battlegrounds for designing SoCs are performance and power. You can always design for what a customer needs, but when it comes to growth markets, does one have more pull than the other? AE: I have a very simple equation inside of Intel for this. Performance per watt per use case has so go up. You’re always competing against physics. Now if we’re talking servers, performance all the way. If we’re talking about stuff we wear all the time, I don’t have one yet but if I’m going to then I don’t want to charge it all the time. Even right now I have a headset that I finally like, but charging it gets frustrating. So in that space, battery life trumps everything there. Between the servers and wearables, everything is in-between so we need to be very clear about what we are doing and optimize specifically for it. I am starting to come to the conclusion that in the ultra-low power space, I think that your average wireless engineer is still going to go for throughput. Their performance drug is throughput, and range. But I am getting into the mindset that the ultra-low power is more about putting low-power first and thinking like a user. We need to think about the power budget like an Aicha who will not wear a wearable if it has to be charged. It should also send something to my phone in case I forget it! I don’t think that in this space there is an ideal formula yet – I think it’s a totally different mindset. It’s funny that at the same time we’re beating each other up over Cat-6, about 2CA (2x carrier aggregation), 3CA, Cat 9/10/11, we’re also back to Cat-0! Again, many thanks to Aicha and Intel for their time. 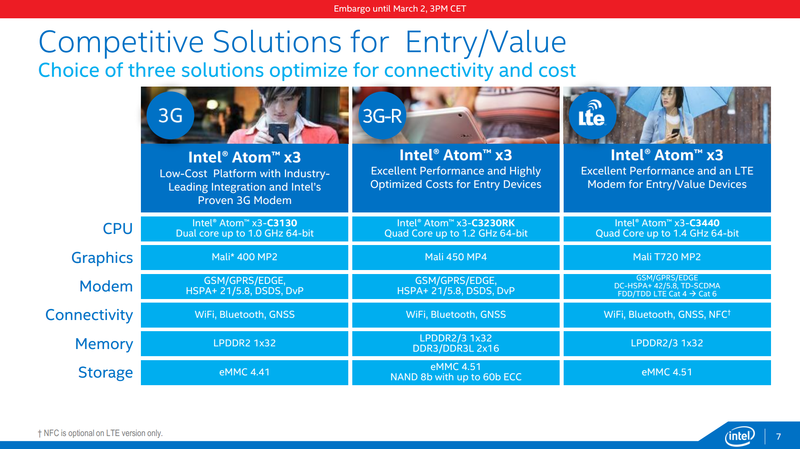 Except the free prices, not clear how Intel can compete with Qualcomm when Connect > Compute for certain use cases. The intro 2-3 paragraphs on how connect is super important was ridiculous. Could replace connect with case housing. Everything needs a case! Servers/tablets/laptops all needs a case! Plastic/aluminum/carbon fiber, we gonna own it all! Everything marketing people say is worthless, might as well just copy and paste a marketing textbook. Marketing is all about making whatever you sell look as good as possible without being caught in a straight out lie. Also, because of the nature of the business, they could be marketing processors in one job and shoes in the next they never really know anything about the product. Most of them know less about their company's product than their customers do. Couldn't agree more. Instead of giving solid worthwhile technical details, all she gives is a vague, cloudy road map. It becomes hilarious where she is asked about whether Atom x3's of future will use Mali or Intel's own GPU.